Looking back over the past year, the number of major economic influences is remarkable. These are huge steps, huge agreements, huge factors. This is usually called for when the economy is doing terribly. All this is happening when interest rates and unemployment rates are historically low. You might compare the aggregated stimulus to throwing gasoline onto a fire. Recently I was at a breakfast meeting with the two top housing economists in California. We were meeting with Tim, a very bright guy who writes a marvelous blog. Tim mentioned he did not really study economics, he studied Political Science. I think that may be the best background to study what is now happening in our economy. The Federal Reserve decides Monetary Policy, and has raised interest rates four times in 2018, to slow the economy down and control inflation. During the Big Recession, they provided stimulus in many creative ways to keep our economy from totally falling apart. Just like the supreme court, their charter is to operate independently of other government pressures. Very simplistically, they slow down the economy by raising interest rates, and they boost the economy by lowering interest rates. Congress decides Fiscal Policy. Last year, the Federal Government approved a budget spending increase of 10%. This provides a monster fiscal stimulus to the economy. The entire federal budget comes in at just over $4.4 trillion in 2019, an increase of $400 billion over 2018, placing it onto our credit card. It looks as if the 2019 deficit will possibly be $1 trillion. Historically, that kind of deficit spending is what is needed when the country is in a recession, not when business is booming. With passage of the Tax Cuts and Jobs Act, the corporate tax rate declined from 35% to 21%, and also provided decreases in personal income tax rates. It also made it less attractive to deduct mortgage expenses. Thus far this Act has not created much in wage growth, even though the unemployment rate is at record lows. And without the expectation of higher future wages, homebuyers are reacting conservatively, not wanting to buy more than they can afford. This package of corporate and personal income tax decreases should add up to $1.5 trillion in taxes over the next decade. But the savings need to make it through to the average homebuyer in order to give them the comfort level needed to make the long-term investment in a home. The repatriation of profits held overseas by American Corporations—first estimated by the President to return $4 trillion to the US economy (the Fed estimate is only $1 trillion) , has to date only recorded $465 billion returned. It was hoped that much of this money would be utilized for investments in plant and equipment and increased wages. It is too early to determine how the money was invested, but stock buybacks appear to be the major use of these funds. That is a one-year stimulus, mainly for last year. Perhaps all this stimulus may help us bypass a slowdown (recession). However, most economists agree that we are due for a slowdown after so many years of growth in the economy, if not in 2019, then most probably in 2020. Perhaps the biggest problem is the UNCERTAINTY in today’s world. We are in a war—a US-China Trade War—Tariffs and threats of higher tariffs, still negotiating now. Fingers crossed. We are also charging tariffs on major European produced goods. All these tariffs make goods more expensive to buy, leaving less for homebuyers to spend on a home. If Shakespeare were still around, he might say “Brexit–or no Brexit–that is the question.” Will they or won’t they? The US threatened to leave NAFTA, which was then restructured as USMCA. The results are yet to be seen. And finally, the housing market has slowed down, while the stock market has never seen such a wild ride. Stock market investing today requires a strong stomach. Perhaps it will make a housing investment look more stable and desirable. Lots of fascinating stuff going on if you are an economist, but how does this all affect us and our housing market? We had lots of craziness 10 years ago, but now real estate may be one of the most stable areas we can point to. In spite of the Fed increases, mortgage rates, based on the 10-year bond, have recently turned lower to the benefit home buyers. (In times of uncertainty, investors find the bond market attractive, and that lowers rates on the 10-year bond). Ten years ago we dealt with nothing down, with teaser rates that would “re-set”, and we ended up with the housing/mortgage crisis being the root cause of the entire financial crisis. Banks were taking homes away. REOs changed into Short Sales. Our area began to rely heavily on FHA financing, a method that was hardly every used prior to 2007. The new loan of choice was a 30-year fixed rate. Things changed, drastically. Even though we have all this uncertainty, let’s get back to the basics of supply and demand. The past couple of years have been a sellers market, with the majority of homes selling with multiple offers. Perhaps the housing market has already been through what the stock market is going through now, Mr. Toad’s Wild Ride. But all that is changing. Buyers reached the limit of what they can and will pay. Home prices are not pushing higher. The market has leveled out and is at this point balanced between buyers and sellers. Some sellers may not have caught on to that as yet, and continue to list their homes with high price expectation. Around 50% of homes on the mls have reduced their prices from the previous month, and around 20% have expired and were re-listed. Good homes priced well continue to sell quickly, homes not in good shape and overpriced are lingering on the market. 2018 was the year of balancing. There are still some multiple offers, but they are the result of the desirability of the home, not speculation. How much have things slowed down? How did the number of homes sold last year compare to the history of the past 14 years? Not bad at all. 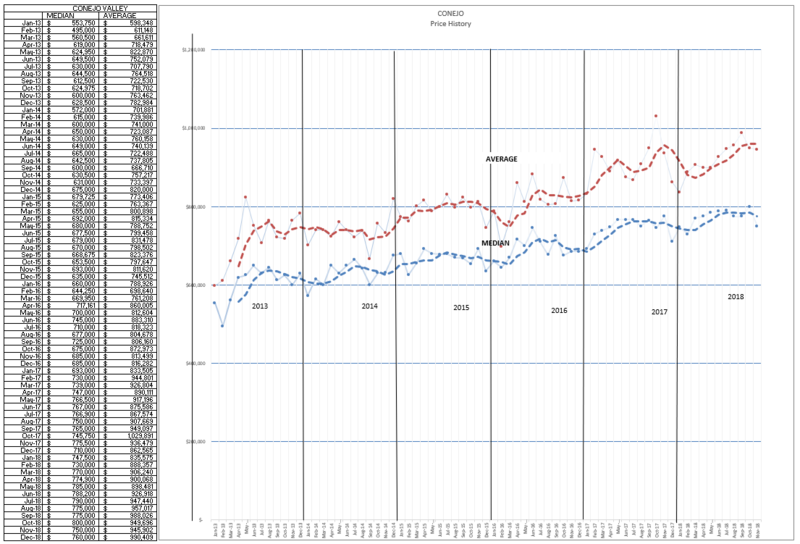 The charts above tell us that things continue to go well, just down a little from the year before. 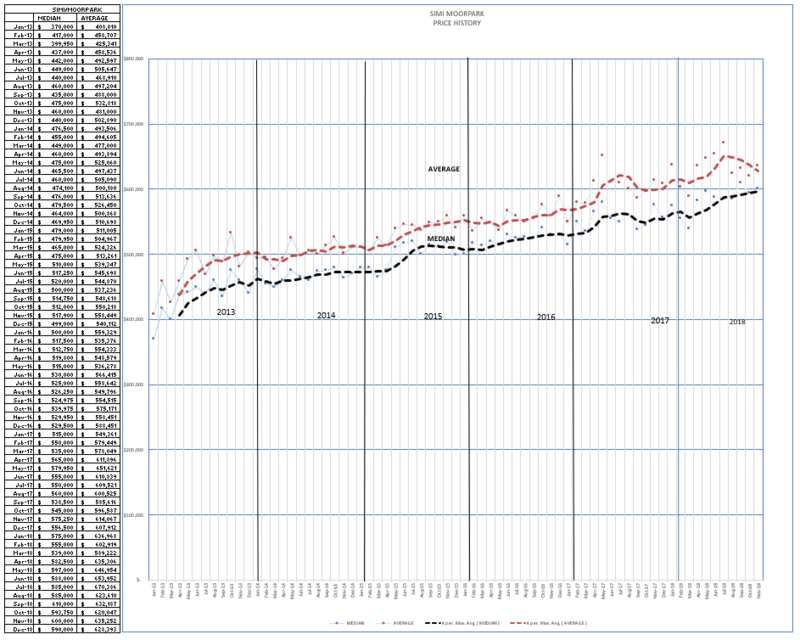 But these are annual charts, with one point representing the average of the entire year. The trend at the end of last year showed slowing. How about prices? Due to low inventory and high sales in 2017, prices rises carried over into 2018. But they are leveling out. 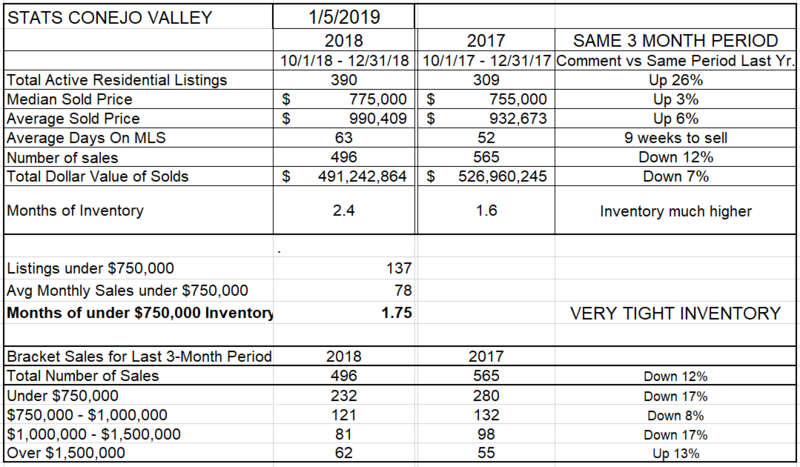 Median prices in the Conejo Valley began the year with $747,500 in January, and ended the year at $750,000. Basically the same. 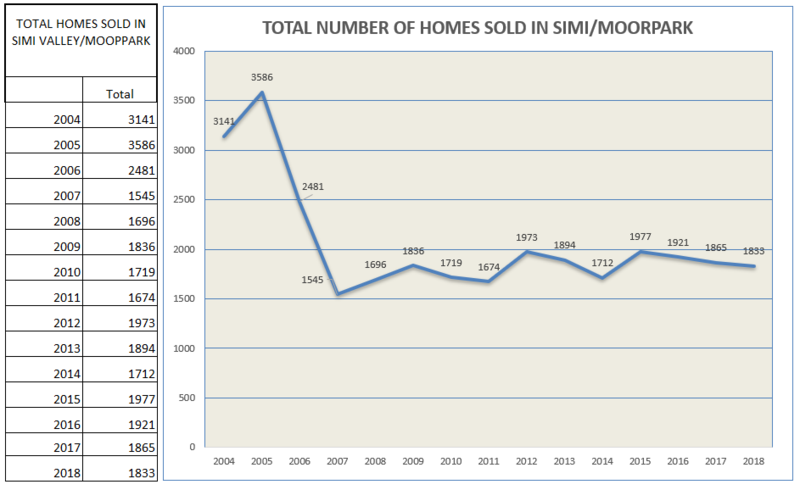 Simi/Moorpark prices began the year at $575,000, and ended the year at$590,000. 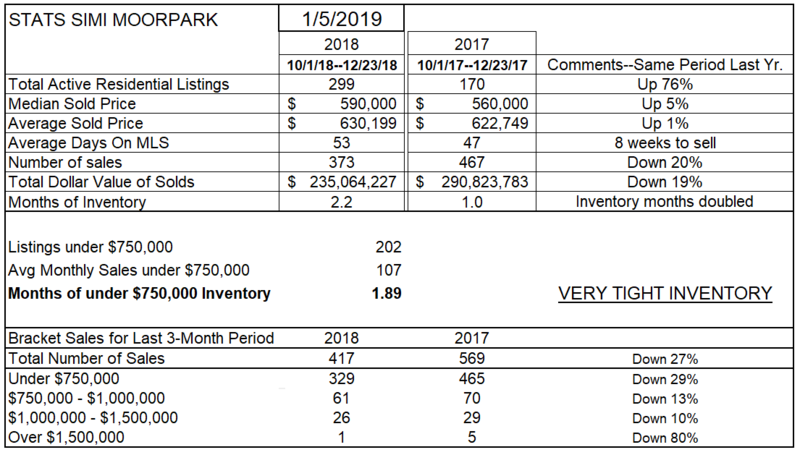 Activity and price increases in Simi/Moorpark began the year strong due to a ridiculously low inventory, then slipped considerably in the last half of the year. How about inventory? If sales are not increasing, inventory should be rising. 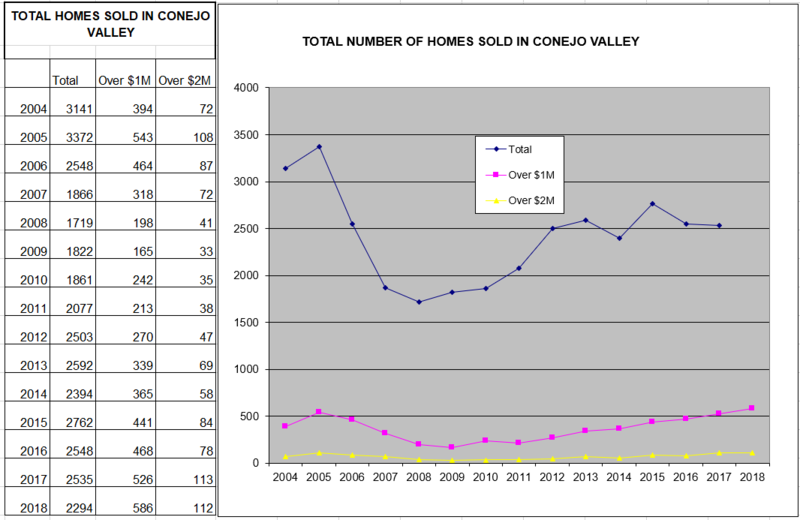 In the Conejo, we finished this year with more inventory than the previous four years. Nothing drastic, but higher. But in Simi/Moorpark, the year began extremely low and ended the year very high. Sales slipped dramatically for the last half of the year, and inventories grew dramatically. Finally, lets look at the three-month comparison, three months that ended 2018 with the same three month period in 2017. 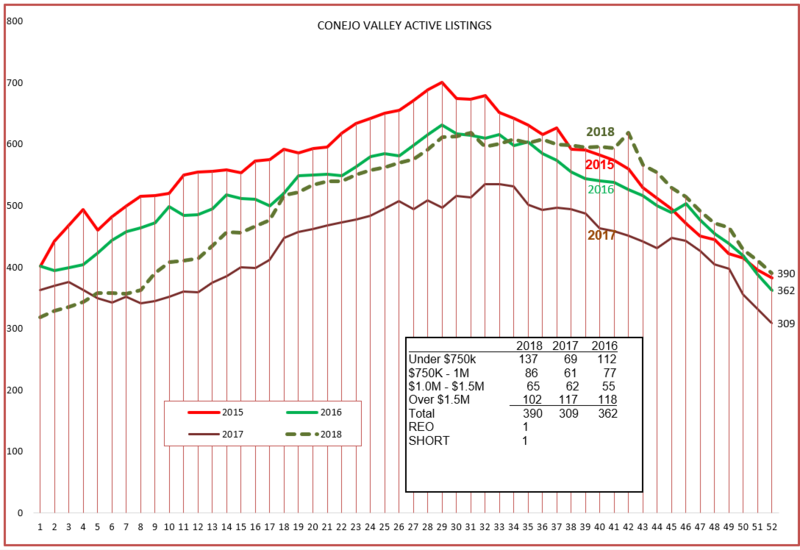 For Conejo, inventory up 26%, the number of sales down 12%. Many of us look at a three month inventory in our area as normal, average, usual. We are approaching that number. Sales were down in every price category except the highest. 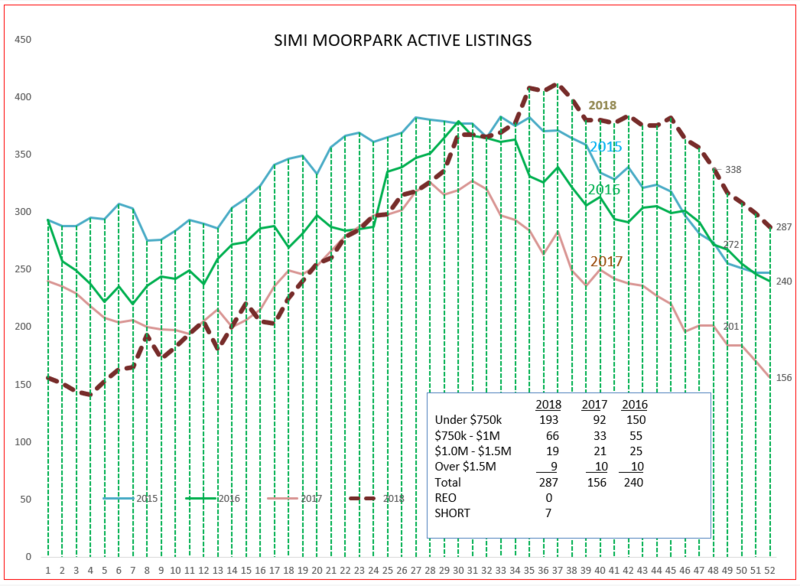 For Simi/Moorpark, inventory increased a whopping 76% while the number of sales were down 20%. Months of inventory changed from an anemic one month to twice that number, more usual, more regular, more normal. For all our valleys, the last half of the year was a slowdown, bringing the annual comparisons down. Volume was down in all price categories. How do we begin 2019? About the same as we ended 2018. Continue to do what you do well. Take good care of your clients, give good advice, work hard, and 2019 will be a good year. Be good, and Happy New Year.